There are several reasons why growers are taking their farming operations indoors. Erratic, devastating weather is on the rise, with flood insurance claims reaching $3.5 billion per year in the US (according to statistics from The Dec Page). Challenges with growing tomatoes during the winter season is another issue many growers hope to address with indoor cultivation techniques. There are several reasons why growers are taking their farming operations indoors. Erratic, devastating weather is on the rise, with flood insurance claims reaching $3.5 billion per year in the US (according to statistics from The Dec Page). To reduce the risk of getting outdoor crops wiped out, resulting in millions of dollars lost within days, businesses are choosing to keep their plants protected inside buildings. Challenges with growing tomatoes during the winter season is another issue many growers hope to address with indoor cultivation techniques. For supermarkets, instead of relying on shipments from farmers in warmer regions, which can be thousands of miles away, they would be able to have direct access to staple vegetables year round – without additional shipment costs and downtime at the store. Growing tomatoes indoors is no easy task, but as you can see, based on the information above, the rewards outweigh the challenges associated with unforeseen risks and costly, outdated solutions. There are generally two types of tomatoes that are grown indoors: determinate and indeterminate variants. The first only grows up to a certain point, at which it will stop growing after producing one, big tomato. On the other hand, the latter grows and expands in a vining configuration. This type is ideal for people who want to grow tomatoes in abundance, as it will offer continuous yields when maintained properly (pruning and caging for guidance). For indoor growing, indeterminate tomato plants are recommended. Tomato plants are very responsive to light and will grow under a wide variety of systems, such as HPS, fluorescent and LEDs. However, for optimized growing, fluorescent and LEDs are preferred. When it comes to color temperature, the lower range of the scale between 2,000K and 3,500K helps promote flowering as the plant starts to produce tomatoes. High color temperature ranges, between 4,500K and 6,500K, are useful for a full spectrum approach to cultivation, since it addresses all stages of the growth cycle. To closely mimic natural daylight, growers may use luminaries with a color temperature of 6,000K. As for the light color used for growing tomatoes, growers are not limited to using pure white light. In fact, this practice is slowly being replaced with the use of a combination of red, blue and far red light. Red light, with a spectrum range of 600-700 nm, is very effective in promoting photosynthesis. A small mixture of blue light (ranging between 400-500 nm) is needed to prevent growth abnormalities associated with using only red colored lamps. Far red bands, measuring 700-800 nm, are applicable to controlling tomato plant responses to day length, as well as the shape and size. It is important to consider that tomato plants don’t need 24 hours of light for optimized growth. Ideally, the crops need around six to eight hours of darkness per 24-hour cycle. The plant uses this time to absorb and process carbon dioxide. Exposing tomatoes to persistent light without darkness in between the cycles will cause them to grow slower with smaller yields. The main reason for stunted growth is lack of carbon dioxide needed to complete photosynthesis. Without going too deep into different lighting technologies available today, LEDs are the most energy efficient (up to 30 percent in savings), reliable and compact options for indoor cultivators. The cutting-edge lights come with a lifespan of up to 50,000+ hours and do not use harmful compounds for illumination. They can accommodate tight configurations for intense lighting requirements. Additionally, growers can control the temperature of the location more accurately with LEDs (at a range between 70 °F and 90°F – below 60 °F reduces growing efficiency), since they don’t release much heat during operation. This also allows the lamps to be installed within close proximity to the plants. All of these benefits make them ideal selections for indoor LED grow lights. For uniformity and accurate targeting, some indoor grow lights come with reflectors. This is more common in fluorescent lighting systems, as LEDs emit beams that can easily be directed because of the way the chips or diodes are installed on the board. Even light distribution is key to yielding consistent harvests. To maximize light distribution, horizontal lighting configurations are highly recommended. By comparison, vertical positions decrease lighting effectiveness by up to 40 percent. A combination of horizontal and vertical lighting systems can help improve uniformity by illuminating all aspects of the plant, including the underside of leaves. This is not attainable with solely using overhead grow lights. 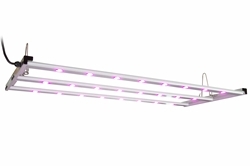 The compact characteristics of LED grow lights also allows space-saving configurations, such as multi-layer mounting and stacking. These options maximize light usage by installing the plant beds very close together. Contrary to popular belief, indoor grown tomatoes are not bland and tasteless. In fact, a number of studies have debunked such rumors and assumptions. According to a study published by Wageningen UR Greenhouse Horticulture, tomatoes grown using LED grow lights contain up to two times more vitamin C content, when compared to naturally grown variants. This was also observed in dill and parsley in a study conducted by researchers from Vilnius University, Lithuania. Lastly, a 2011 Japanese scientific report (Regulation of carotenoid accumulation and the expression of carotenoid metabolic genes in citrus juice sacs in vitro) was able to conclude that exposure to artificial blue light can help boost antioxidant levels in some fruits and vegetables.